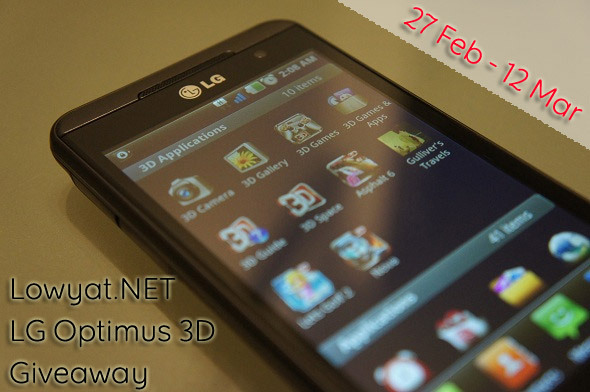 It has been a while since we’ve given away some swag on Lowyat.NET, and this week we’re pleased to announce that we are working with LG to set you up with a sweet 3D phone in the form of the Optimus 3D (RRP $1749). As always, the contest mechanics for the Lowyat.NET x LG Optimus 3D giveaway are so dead simple that all it’ll take to be in the running for this sweet device is a little reading and some creative thinking. We have two devices to be given away, and to be in the running to take home the LG Optimus 3D just answer all the questions above, fill in the slogan and drop an email to submit@lowyat.net along with your full name, IC number and phone number by 12 March 2012.